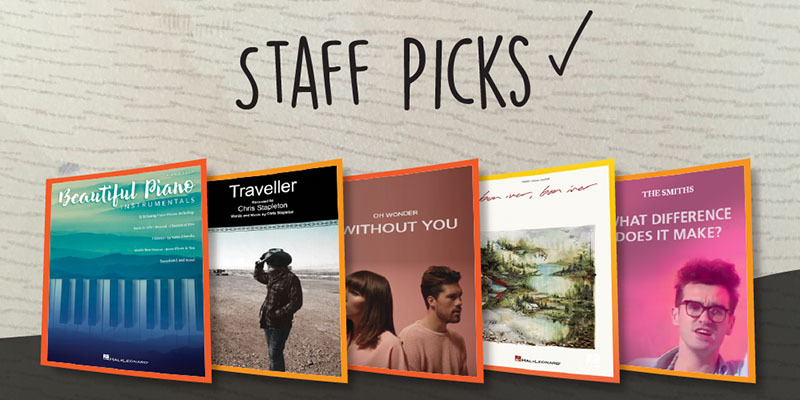 Discover new music with our Staff Picks feature! This week's picks include an eclectic group of sheet music titles, including new age piano, country, and UK pop. "Return to the Heart' is a wonderful introduction to the beautiful music of Grammy-nominated New Age pianist, David Lanz." "This is the first track off of Stapleton's debut solo album Traveller. Great authentic country feel!" "London-based Oh Wonder are a relatively new name in the world of pop music, and they had an unusually methodical approach to the creation of their debut album - recording and releasing one song a month for a period of a year. The penultimate single in this cycle, 'Without You' features some lovely piano melodies and is a real treat to play without being over-complicated." "A tour-de-force jangle-fest from their 1983 eponymous debut album, "What Difference Does It Make?" is The Smiths at their finest." "Justin Vernon, lead singer/songwriter of Bon Iver, wrote the band's first album in a northwoods Wisconsin, USA cabin. This song was the breakthrough hit and was featured on Grey's Anatomy. Check out Birdy's popular piano cover."